Lockheed Martin has completed a series of initial flight tests on its new beam control turret designed to provide military aircraft with a 360-degree coverage area to engage missiles or other aircraft with laser weapons. 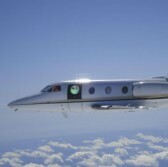 The company said Monday it worked with the University of Notre Dame and the Air Force Research Laboratory to demonstrate the functions of the Aero-adaptive Aero-optic Beam Control turret, which was fitted into a research aircraft. Doug Graham, vice president of advanced programs for the strategic and missile defense systems business of Lockheed’s space systems business, said the ABC turret works to help integrate high-energy laser systems with the aircraft. 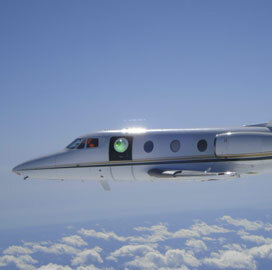 Lockheed built the turret for AFRL and the Defense Advanced Research Projects Agency to leverage flow control and optical compensation in order to work around turbulence caused by the turret’s protrusion from the aircraft fuselage, Lockheed said. Initial tests took place over eight flights and the team plans to conduct more exercises next year.